We do lots of cutouts of people. One of the more popular things is to do a wedding photo for a 25th or 50th anniversary celebration. Here’s one we did for a 25th anniversary party for a couple. Everybody loves cutouts like this, and they are the center of attention at the party. Well, maybe except for the guests of honor. It’s really fun to see what they looked like so long ago, and also to have them life sized. All you need is a pretty good photo, and we’ll take it from there. 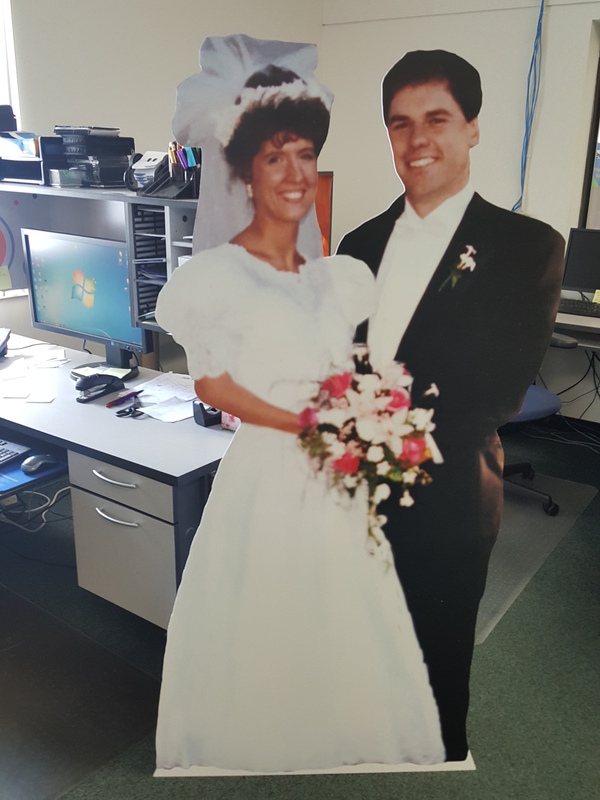 You can have it scanned locally and send us the jpg file, or we can scan the photo here and make your full size person cutout from it. Either way, you’ll have something fun! This entry was posted in large format printing and tagged cardboard cutouts, cutouts of people, person cutouts, photo cutouts. Bookmark the permalink.